"I've been using the software for a couple of months now and don't know how I kept track of things before hand. I have a number of tanks and this database makes life so much easier. I used to keep spreadsheets but this was so time consuming and cumbersome. AquarioGest makes scheduling cleaning tasks; keeping track of water parameters and all the other things I need so much easier. Cheers." "I have been using your excellent software for several months now and just want to tell you how invaluable it has been in keeping records of my multiple tanks !" "A well thought out and planned software package that takes the guesswork out of aquarium management." "I would like to let you know that your AquarioGest program is fantastic! It is thoughtfully designed and beautifully written. I have been an Information Technology Professional for over 15 years, and have written applications in many different programming languages. I am very impressed with your thoroughness and attention to detail, and I will recommend your software to anyone who has an aquarium." "This really is a delightful piece of software. Not only is it very functional, but also very attractive, making it a pleasure to use. It adapts well to use with ponds as well as aquariums as everything is user configurable. I use it very successfully with my Koi pond. I have contacted support on a number of occasions both before and after my purchase and they have always responded quickly and answered my questions first time around. I highly recommend this software to anyone who wants to manage their pond/aquarium/fish!" "I just wanted to say thank you for responding to my many requests. I have over 25 freshwater aquariums, most of them planted and it is nice to finally get them organized and things cataloged." "I have rarely received such excellent tech support with my software issues. Prompt, polite and effective!" "A wonderfully made program. Very easy to use. The database of fish is excellent! The support staff is very helpful." "Thank you very much! So far, I am pleased with the design. It seems you have made the program not only useful, but fun as well." "Great. Have spent ages looking for something to do this job and this fits the bill perfectly." "This is very excellent software, and I have suggested to many others that they use it as well. AquarioGest is the BEST software I have ever seen." "Obviously the people who buy this software are intent on keeping track of their fish. I LOVE this program! I have only been using it for 2 days and can not imagine how I ever did without it before." "My wife bought me this program, just wanted to say it is a great program. It does everything and more of my other fish programs that I have ever used. If you make a saltwater version one let me know, so I can purchase one. Keep up the good work. Very pleased customer." "The software is very good, and very helpful to beginners..."
"Hello there! Me and my girlfriend just bought the program from you. It´s great." "Thanks, I love the software, it's great!" "I had originally attempted to keep my own records using Excel spreadsheets; however, your software package make it so easy! Thanks again for a great product!" "This program is great and exactly what I was looking for." 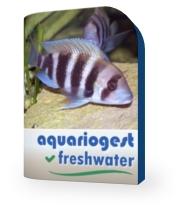 "Very good program, loaded with details to help you keep track of your aquarium."